In today’s SpeakUp post, Janelle Hite shares the story of her son’s illuminating experience with AAC in the classroom and the powerful impact it had on their #AACFamily. Our eleven-year-old boy, Logan, is no stranger to dreaming big things, not only for himself but his brothers, Nathan and Owen, too. As Logan’s parents, we believe in the importance of serving others in cross-cultural experiences, so when Logan was just one year old, we took him on his first trip to China. By the time Logan was three, he had traveled to China three times, spending a total of six months there. When his brothers were born, we wanted all our children to share in serving. As a family, we traveled to Lebanon, where their dad designed one of the first inclusion schools in the Middle East, and later to Ukraine, to adopt their then-eight-year-old sister. We have also taken two trips to Ecuador, both to help with church construction – one in the Andes and one in the jungle. In all of these settings, Logan has been a part of sharing the love he has for his brothers with the people of these different cultural settings and the knowledge that they were made perfectly just the way they are. At home, the boys love to participate in sports, playing Miracle League Baseball and swimming. They also enjoy watching sports and cheering on their favorite teams. Nathan’s favorite is Clemson and Owen likes Georgia Tech. When we watch college football, we often talk about the day when the three boys will go off to college and where they may each go. Our family may look a little different that you imagine. Nathan and Owen move around with the assistance of wheelchairs, gait trainers or a walker and they communicate by using augmentative and alternative communication (AAC). Owen uses a 15” dynamic display speech generating device (SGD) with eye gaze capabilities and Nathan uses a 10” dynamic display device by another manufacturer. Nathan also listens through his cochlear implants. In addition to being a parent, I am currently pursuing my Masters of Education in Assistive Technology from George Mason University. One evening when I sat down to watch an online lecture by Yoosun Chung, Logan was doing his homework nearby and overheard the introduction. In this introduction, Professor Chung mentioned that she had cerebral palsy and was speaking through a communication device. Logan paused and asked, “Mom, did your instructor say she uses an augmentative communication device?” I said, “yes, buddy. Why?” He said, “I can’t tell you now because I will cry.” About an hour later he came to me and said, “I am so excited your teacher uses an augmentative device, because now I can really see an example of how my brothers can do something great with their lives too.” He loves his brothers and always talks about them going to college, but I think this was the first time he learned of someone using a communication device and being so successful in their career. Through Logan’s life experiences, he is able to dream big dreams for himself and his brothers. 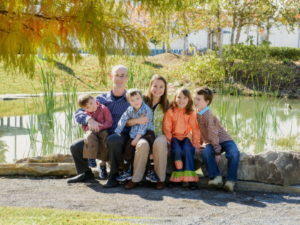 Janelle Hite is a mother of five: including one deceased and one adopted. She and her husband, Preston, married in 2001. Before motherhood, Janelle had a career in television, which she traded to be a full-time mom. She is now pursuing her Masters of Education in Assistive Technology from George Mason University, online.